This is a story for Friday Fictioneers, which is hosted by Rochelle. Every week you are challenged to write a 100 word story based on a photo. Thanks to Courtney Wright for this week’s photo and also to Rochelle for hosting the challenge. Thanks to all the readers for their time, too. 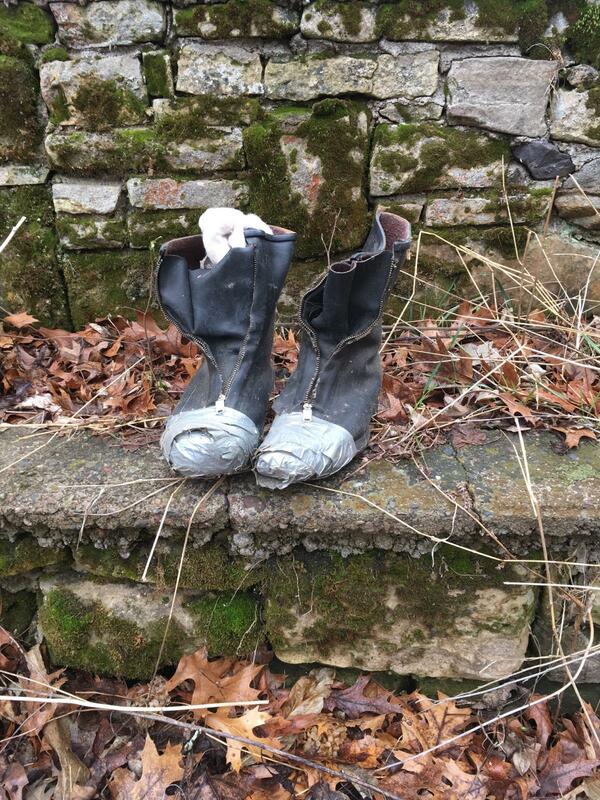 PHOTO PROMPT submitted by Courtney Wright. The girl prodded her path with a wooden stick in hand. Today, she was in luck. She found a shiny pair of boots. It hardly mattered, if they were of her size or for boys. She picked her find and analysed them. The shiny duct tape made her think of them as some magical boots. With a joyous chuckle, she threw her stick in the air and slid herself in the pair. As she walked her feet could barely keep up with the shoes. They made a wish! woosh! sound. Together they disappeared in the pathway of tall grasses. I wonder where they’ll lead her…..
Hope she is able to keep that attitude as a grown up as well. Makes you wonder what happened next….well done! Couldn’t post my comment for your story so I’ll just add it here. A long day doesn’t seem that long enough when the little ones show their loving gestures. Beautifully written! I had watched a documentary on Jonbenet a night before. Although I had no intention of watching that but somehow I did and chose to wrote this. Being swept off her feet, that’s the trouble with boy’s shoes. Sounds like they might be magical after all! Hoping she is off on a magical adventure. Who knows? Hoping the best for her. You’ve captured the joy of finding magic shoes. Imaginative piece. As children even the littlest of things give us immense joy. I like the concept of the magic boots taking control. Now where will she go? Don’t know Jilly. Hope she goes some place safe and nice. This was magically joyful, Norma! Loved it.